Thread: I'm having trouble deciding on my first controller! Hi guys, this is my first post on these forums, I've been doing a lot of research within the past few days trying to decide on a controller. My budget is pretty low because this is my first controller. (max 550 CAD$) I've come a crossroad on a few different controllers. I don't know much about controllers but this is what I'm looking for. I'm mainly looking for something with 4 decks, full eq/gain/mixer sections, and a couple of good fx panels, along with hot cues of course. All the controllers I've narrowed down to are used, and in very good condition I will add the prices if that helps give a better idea of things. I've narrowed my search down to the Traktor Kontrol S4 MK1 for 450$ (MkII is out of my price range). Numark NS6 with custom bag for 550$. Pioneer DDJ-T1 for 500$. And finally the cheapest, the Behringer CMD Studio 4a, which would be around 250$ new. Any suggestions or feedback would be greatly appreciated ASAP! Thanks so much! Modular with an external mixer is my suggestion, I'm not a fan of Traktor's internal mixing. It just doesn't sound very nice to me, not sure why. You can pick up a used DJM500/Denon DN-X1500 or something similar for 200-300 bucks easy. Then for modular controllers, you should consider what kind of style you'll be taking. If you don't mind using sync and will be mixing basic 4 beat songs like house/trance, a Zomo MC-1000 is a fantastic choice. Very simple and good FX control. If you want a platter, Reloop Contour and Behringer's option are very nice as well. You can also consider the Traktor X1 (MK1 for 80-100 ish, MK2 for 100-130 ish) which is a very capable controller as well. Pretty much everything I've suggested has easy access to the 3 FX knobs and hot cues. And since it's modular, you can easily move to tables or CDJs or adjust your controller setup as needed. 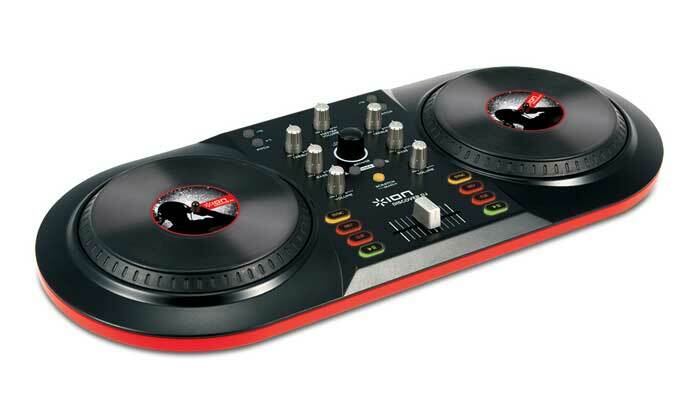 Pioneer DDJ-SR is 540 brand new - worth a look. Just saw the Pioneer DDJ-SB was only 300, ~180 used. That would not be a bad choice at all either.